Figure 3 shows a 3 hour animation of the 1-min visible imagery in the region of concern. Note the deepening cu field and eventual clumping of cu across northern PA into southern New York between 15 and 17Z as mentioned in the two MD’s, followed by the eventual growth of robust convection between 17 and 18Z. Fig. 3: May 22, 2014 1501 – 1802 UTC GOES-14 1-minute visible imagery. Convection would continue to grow upscale out of this cu field, primarily producing widespread severe hail across the region, with the first report coming in at 1722Z (Fig. 4). Fig. 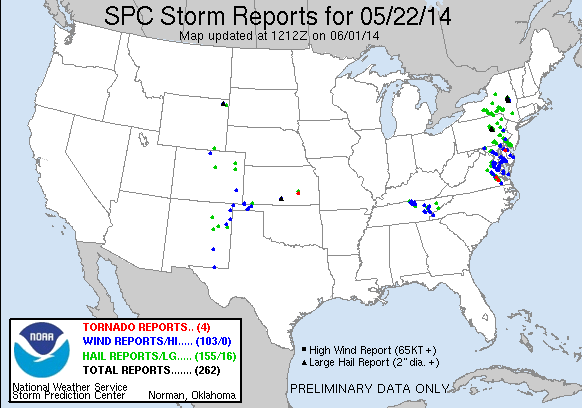 4: SPC storm reports for May 22, 2014.